Ok, it's been done before, but why let that stop me? Through the holidays, when you visit my blog, here, you'll add to the household festivities because a little bell in my office will jingle. And also, an angel will get its wings. 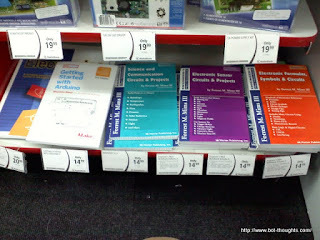 I've been visiting Radio Shack stores since I started dinking around with electronics in high school in the 80's. I'm not affiliated with them, but I've always been a loyal customer. 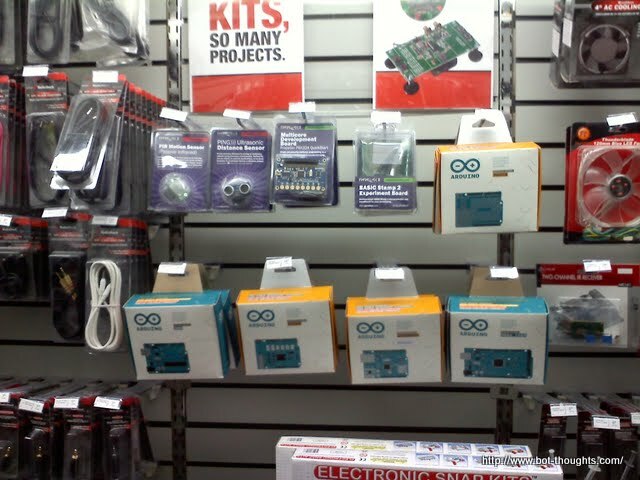 Though I've heard many hobbyists dis them over the years, at least they've always had components on the shelves. 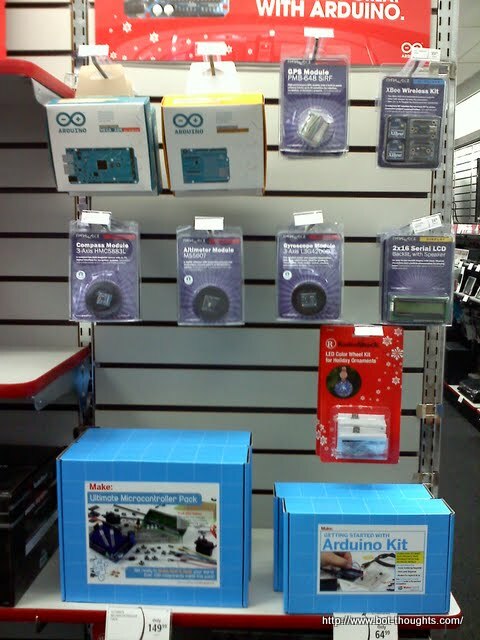 Arduino and Parallax gear including a Propeller board! 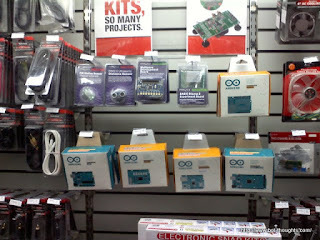 Propeller boards, Arduino boards, Make kits, gyros, GPS, and on and on. Radio Shack is carrying a lot of really great hobbyist/roboticist/maker/electronics nerd gear. Go check it out. Never have I been so excited to visit a Radio Shack since the days of blue Archer packages and speech chips hanging by the dozens. Radio Shack has been saying recently that they're committed to DIYers. If this doesn't convince you, nothing will. RoboTurkey's actual name is Oscar (all Thanksgiving turkeys are named Oscar in our family). At random intervals, he either moves his head around, flaps his wings, or speaks while moving his wings for emphasis. He simultaneously moves his beak while playing back audio clips of my daughter talking. I'll post up build details in the near future. Pololu is again doing a black Friday sale with lots of great deals and thought you might want to know. I am going to try to be one of the first 50 people to get a 3pi robot, and I have a shopping list of other goodies I'd like to get like a $30 9-axis IMU. Last year I scored a baby Orangutan, a couple of IR sensors, some nice voltage regulators, and a few other things. 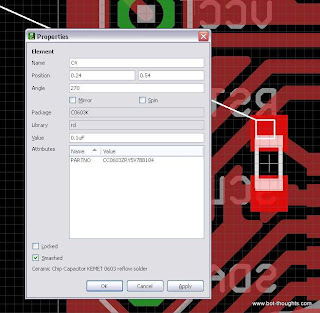 Want cheap SMD clips for your logic analyzer? 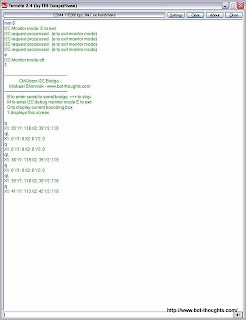 One of my readers, Nemo, submitted a nifty hack to convert budget clips (above, middle) for use with typical female logic analyzer leads (above left). Pokey my Trinity-style firefighting robot likes to blow out candles. It's his job. Whenever I demo Pokey at robotic events, I don't dare light a real candle lest I burn the place down. Holding a flashlight for Pokey to track lacks drama, so here's a DIY electronic candle that you can actually blow out. 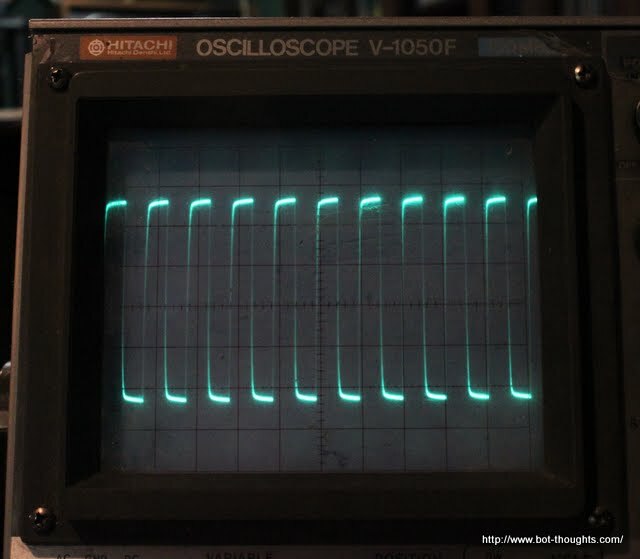 You can build this yourself on a breadboard or on a simple home-etched pcb. I was graciously invited to participate in the Newark Product Road Testing Program and I'll be road testing two ARM microprocessors. 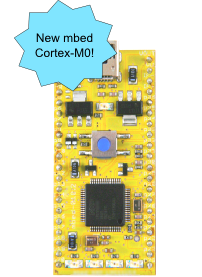 First up is the NXP LPC2101, recently added to Newark's offerings. This past Saturday, my daughter and I had fun at the Thompson Robotics Expo up in Loveland and we set up a table for SHARC to demo Data Bus and Pokey. Pokey, my Trinity-style firefighting robot, ran some demos where the little robot used rudimentary machine vision to search for a 'candle' (flashlight), drive forward to the white floor marker, and turn on the fan to 'blow out' the candle. I need to measure the current going through brushed DC motors. 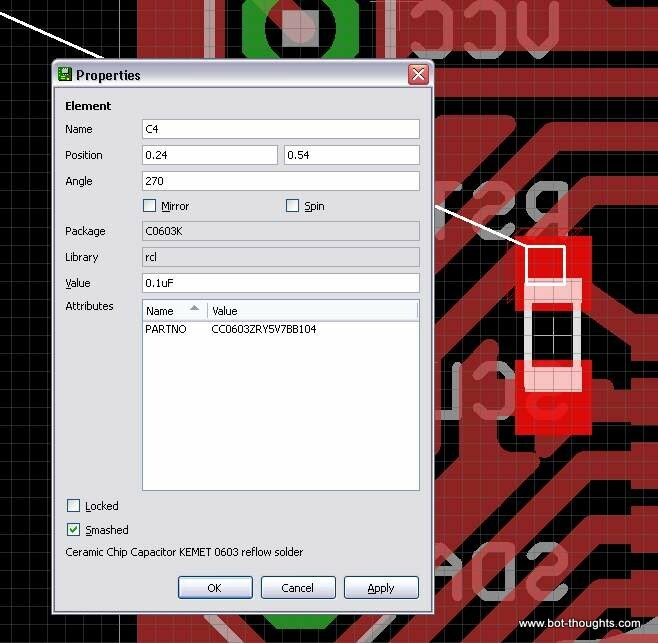 One of the ways to do this is to use a shunt resistor, a low-value, precision resistor. 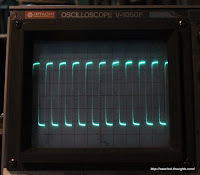 Measuring the voltage drop across the resistor, one can calculate the current through the resistor. I decided to make my very own, very simple, shunt resistor breakout board. 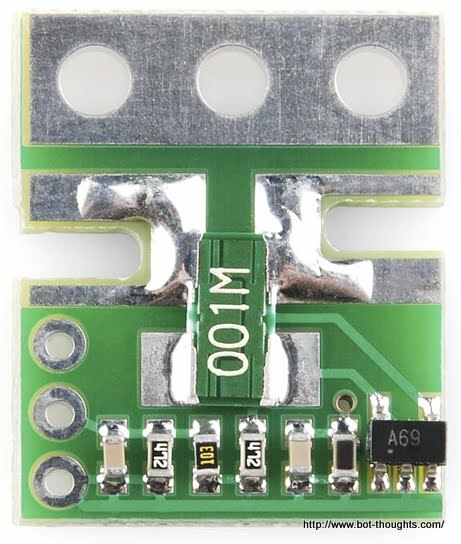 It connects between the battery and Electronic Speed Controller (ESC) or other motor driver. A header is included to measure voltage across the battery and voltage drop across the resistor either with a DMM or a microcontroller. 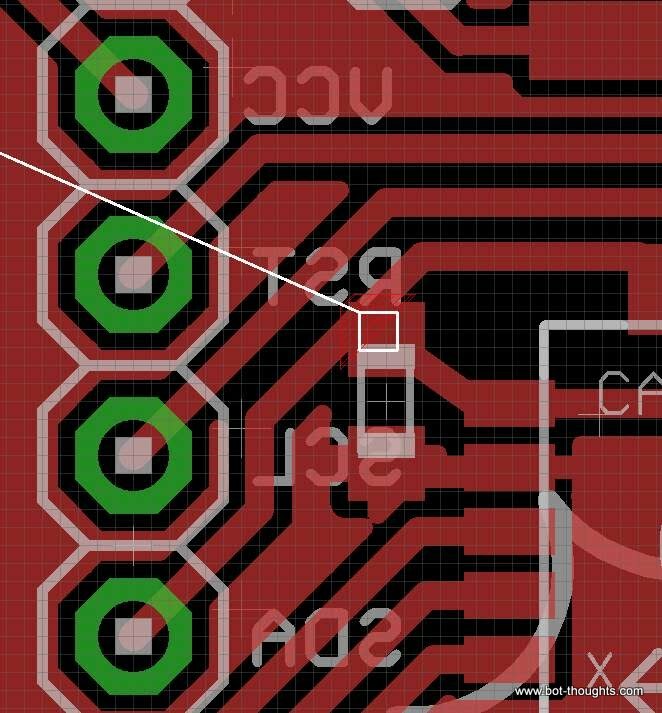 I quickly drew up the design in Eagle, used toner transfer method and etched the board, soldered everything together and voila, simple current measurement. Pretty simple circuit board, eh? 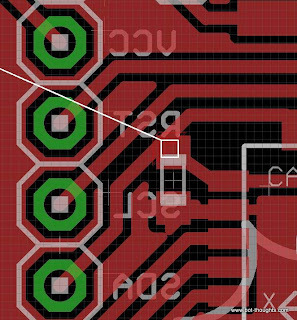 The resistor is 0.001 ohms so 1mV = 1A (it's a Dale-Vishay WSR31L000FEA). My DMM has precision to 0.1mV, thus 100mA here. I selected a resistor with sufficient power handling to measure over 50A continuously. So what the heck am I going to do with this thing? One has to be careful, of course, that the shunt presents substantially less resistance than the load. Some motors have very low resistance windings. For those cases, a hall effect sensor like the Honeywell CSLA2CD seems like it would do the trick. September 1908. Photo: by C.H. Claudy. 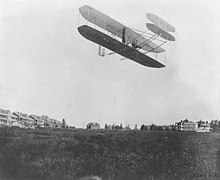 At the time the Wright brothers achieved the first powered airplane flight at Kitty Hawk1, the field of aeronautics had been buzzing with activity for years (perhaps not unlike the present DIY robotics community). Why did they succeed where others failed? It's time. 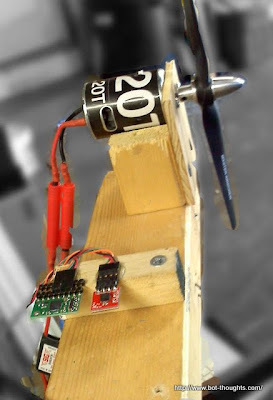 Head on over to the Bot Thoughts facebook page and enter to win a miniProp, a Parallax Propeller on a DIP form factor with built in regulator, eeprom and crystal. Free IDE from Parallax, lots of community support, 8 cores (cogs), deterministic timing, easy to learn assembly, and more. Next Tuesday I'll pick the winner at random out of the list of folks who comment on or like the contest post. Good luck! It's small, it's standalone, it's purple, and it's a Parallax Propeller, aka an experimenters dream. 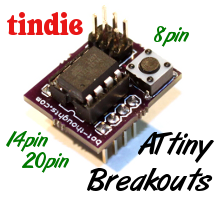 I designed this breakout board and I'm giving away a fully populated board to a lucky reader! I call it the miniProp board. The Propeller has 8 cores (cogs) that operate together in perfect lockstep. The chip has perfectly deterministic timing and really simple assembly language. Writing device drivers on the Propeller is truly a piece of cake. And when you're done you have several cogs left to do lots of interesting things besides. 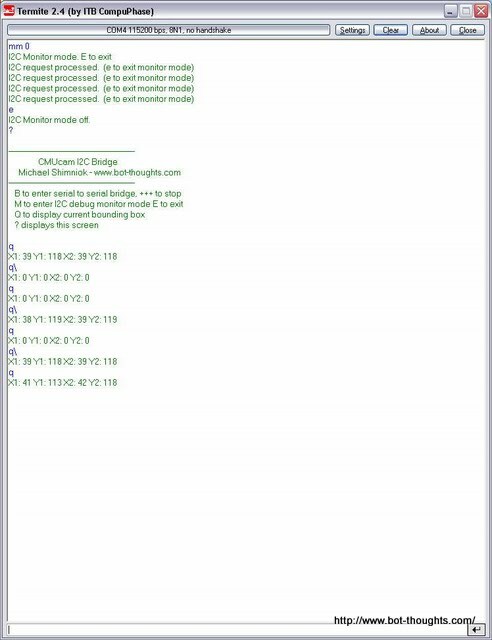 Quite some time ago, I covered how to get two AVRs talking to each other using the I2C protocol. 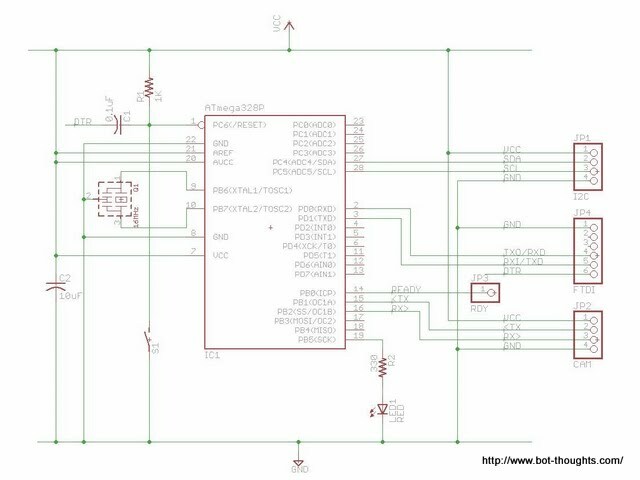 Here's how to get an mbed and AVR talking with I2C, with the mbed acting as Master and the AVR acting as Slave. 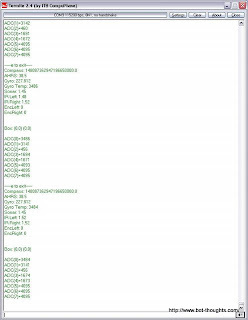 Let's say you want the mbed to query the Arduino to respond with 4 bytes of data. 4. Send the stop sequence. On the Arduino, call Wire.begin(7), where 7 is the Arduino's I2C address. That tells the Arduino I2C peripheral what messages to listen for. Then call Wire.onRequest() specifying a handler function that is called when the master requests data. This only works when the slave has one "register". 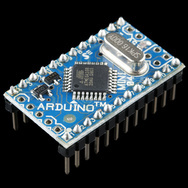 Suppose you have an Arduino that can respond with one of several ADC readings. The protocol exchange would first include the master writing the desired register number to the slave, sending another start, then reading the data. The Arduino would have to accept the register number and store that until the next read request, responding with the correct register's value. My RC airplane Lost Model Alarm (LMA) runs off a tiny CR1225 50mAH battery so low power operation was a must. 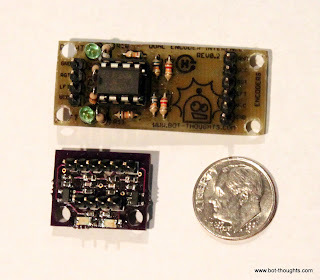 Here's how to save power with your AVR or Arduino project. The XV-11 LIDAR has finally been completely cracked open. Hobby roboticists are on the cusp of DIY, sophisticated, low cost, obstacle detection. The XV-11 uses a laser-based "radar" that can map out the environment allowing the vacuum cleaner to navigate its environment avoiding obstacles like chair legs, sofas, cats, and more. With this kind of sensor your robot can also detect which room it's in. 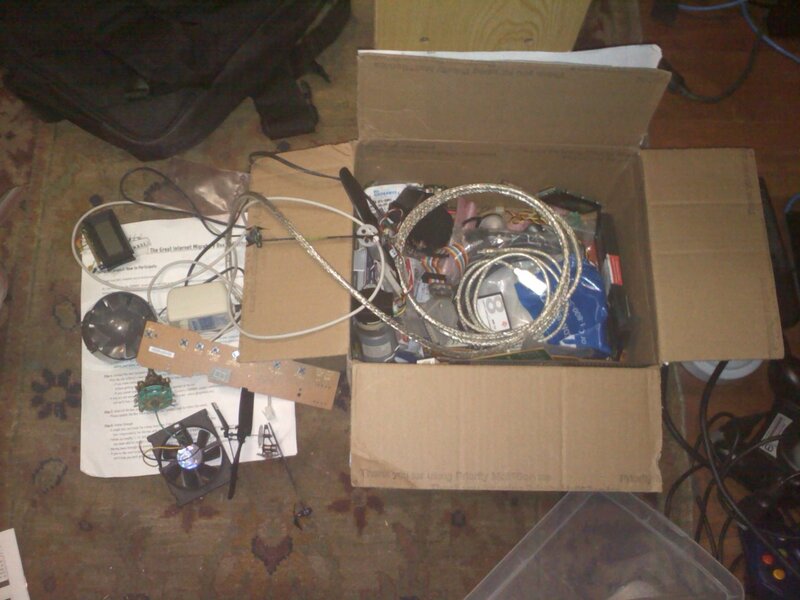 Well, thanks to the winner of the Open Lidar Project, XV-11 hacking contest, now we can build our own: all the chips including the imager are known. Follow the link to find the details. 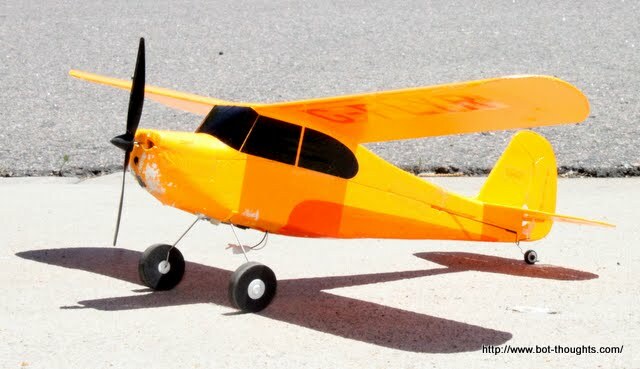 Earlier this summer, I bought and quickly lost a Hobbyzone Champ ultra-micro RC plane. I needed a Lost Model Alarm. Correction: I need to make my own LMA! On my maiden flight, wind blew the light, 1.5-ounce plane away and I lost sight of it over the trees. I'm not the only one. Many other Champs, and maybe other ultra light UM (ultra micro) planes, like those from Parkzone, have been lost by newbie pilots. (Some neighbors found mine, thankfully). While I was working on Data Bus I ran across a few interesting behaviors in GPS signal sensitivity. 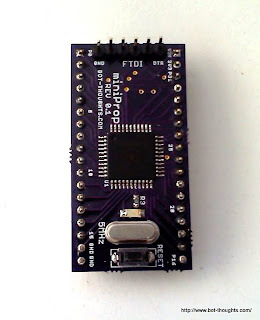 You may recall that Data Bus V1.0 uses a Pharos iGPS-500 GPS module, based on a SiRF StarIII chipset. I got it for under $20 through a vendor on Amazon thanks to a tip from a forum on LetsMakeRobots. First, I noticed that the closer the GPS device was to the chassis electronics, particularly the mbed microcontroller, the worse the signal reception. So I put it up on a mast about 30cm from the main electronics. Second, I discovered that whenever I placed the GPS on a small sheet of metal, signal reception increased by 5 to 10dB for all satellites in view. I am guessing that the metal acts as some sort of ground plane enhancement to the metal underneath the ceramic antenna on the module. Feel free to offer explanations in the comments. On Data Bus, I placed the module on a square sheet of tin about 4" square and consistently got really good reception: 7-9 satellites in the basement, for example. Of course the accuracy still suffered in adverse conditions. Such as, oh, I don't know... sitting on the starting line at the Sparkfun AVC?! 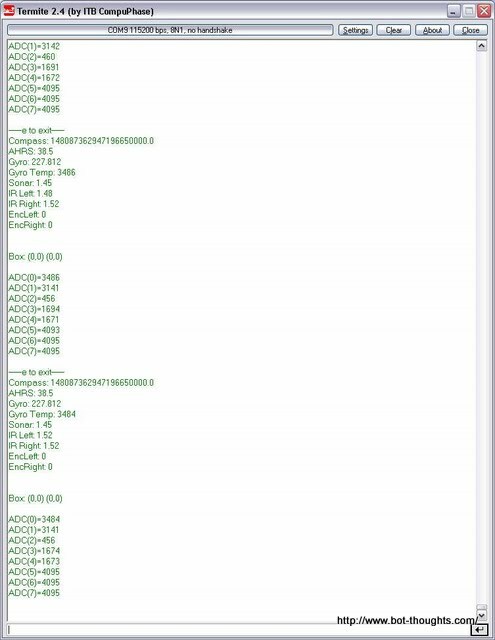 Third, I attempted to add a CMUcam V1 with an Arduino acting as a bridge between TTL serial and I2C and whenever I turned on these devices, the GPS reception tanked. Half the satellites could no longer be seen, the other half were so weak I could hardly get a 2d lock let alone 3d. The cause? I don't know. RFI/EMI? Or dirty power supply? Haven't researched that yet. What I do know is that mounting a GPS sitting atop a 30cm mast on an 1/10th RC truck makes for some craptastic handling. I've been wanting to play with 8-pin AVRs for awhile and finally got around to it. 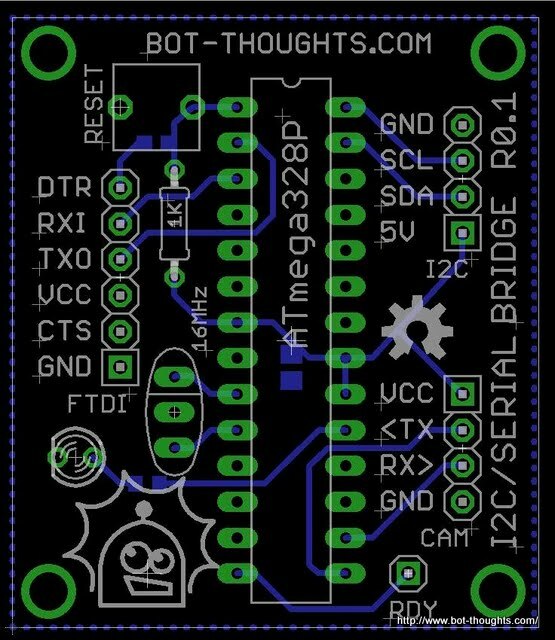 We'll use In-System Programming (ISP), a feature on all the AVR ATtiny and ATmega MCUs (as far as I know). It's a serial protocol, but unlike RS-232, there's a clock signal along with the TX and RX signals. AVR's ISP cables have 6 pins: reset, clock (SCK), data to the chip (MOSI), data from the chip (MISO), as well as Vdd and GND. 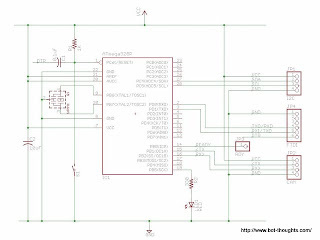 Follow the diagrams on my guide for AVRISP Pinout for 8-pin, 14-pin, 20-pin ATtiny and ATmega328P. 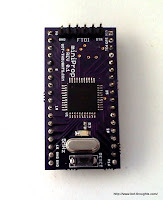 You can use Pololu's inexpensive USB AVR programmer, PGM03A, as I did. It's a great programmer and I used the older version of it for a few years before upgrading. Plug the 6-pin ribbon cable into the programmer, then use jumper wires (I use these jumpers from hacktronics.com) to connect to the ATtiny on the breadboard. Add power (the newer PGM03A has 5V/GND pins) and you're ready to start programming. I've also used a JTAG ICE MkII which is expensive but has worked very well, too. As mentioned (shameless promotion) my eeZee Tiny includes AVRISP header, caps, reset switch and pullup. Add power and start programming. Get the kit from my store on Tindie. 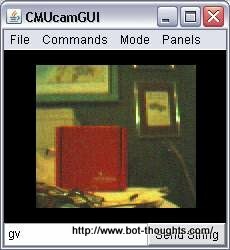 I decided to try AVRstudio 4 for the first time and Pololu has a tutorial on using AVRstudio with their programmer. It's easy to use an AVR programmer/debugger, as you might imagine. AVRstudio has nice debug features that accelerate troubleshooting in certain circumstances. I'm currently using Eclipse with AVR plug-in as my IDE as the editor is significantly better. 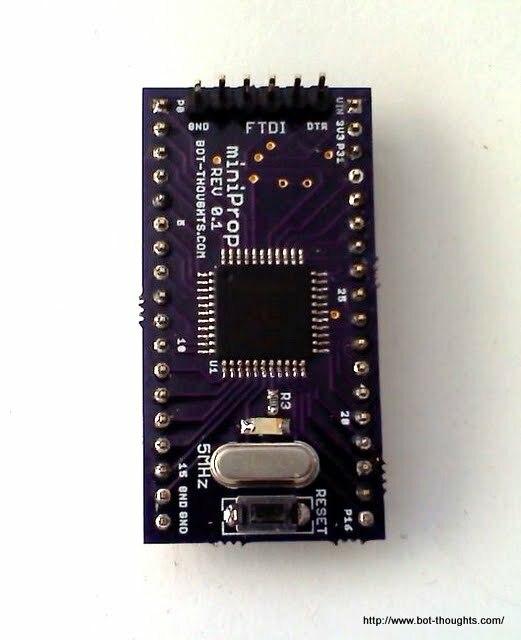 To use the Pololu AVR Programmer, Configure plug-in that you're using an AVRISP Mk II on whatever serial port is allocated to the programmer. The embedded programming version of hello world, as you probably know, is blinking an LED. We'll cast off the fluffy, protective blanket of Arduino and try this, AVR-style. It's not as easy, but it's not very hard either. To avoid programming glitches, keep the ATtiny13 clock speed up (9.6MHz, maybe even disable CLKDIV8) or reduce the programming speed. 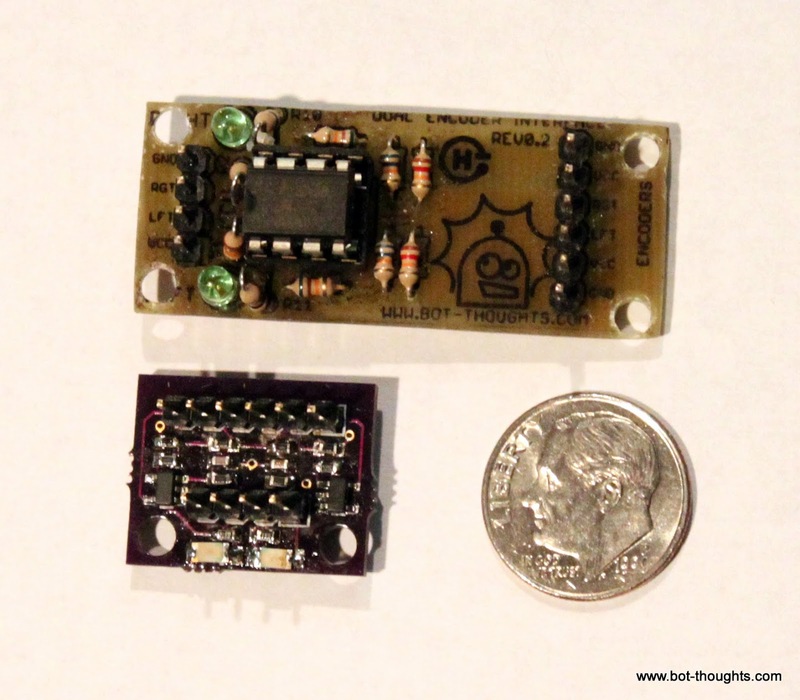 The ATtiny13 is has very little flash or RAM but you'd be surprised at what you can do with it. It does have a timer with PWM modes and a multi-channel ADC. The form factor is, well, tiny, and the 8-pin AVRs are a great addition to the geek arsenal. I've been using 8-pin and 14-pin ATtinys quite a bit lately. Did this help you? If so, do me a favor and share via redit, twitter, Google+, etc. Thanks! 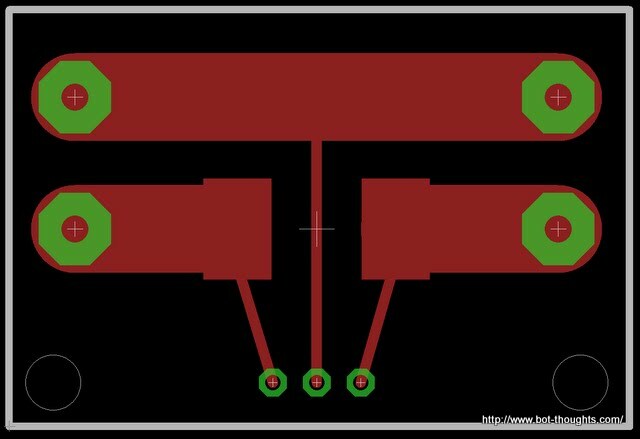 The printed circuit boards are made in the USA, the costs are $5/sq in with no setup fee for two-layer PCB designs. Four layer boards run more but still quite affordable. You order PCBs in sets of three. And the soldermask is a nice, custom purple! ooooo....! 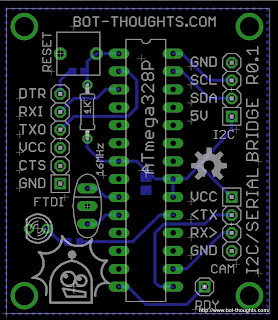 I've been using DorkbotPDX now OSHpark for a year or so now and have done probably a dozen printed circuit board layouts. Every one has come back with excellent quality. The silk screening is very detailed, the plating is fantastic, the soldermask are always right on. That's what you get when it's made in the USA. And you get fast turnaround (in the US), usually within a couple weeks. He's now doing so much volume that he's sending 2 or more boards per week to the PCB fabrication company. Laen reports a very low error rate of about 1 in 10,000. 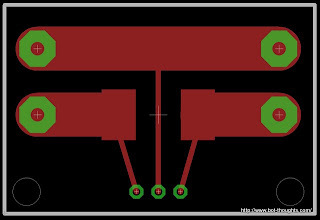 Can't say enough good things about this service and I often prefer to wait a few weeks and just have the board fabricated than etching my own single-layer PCB at home. I've now gotten heavily into SMT designs. 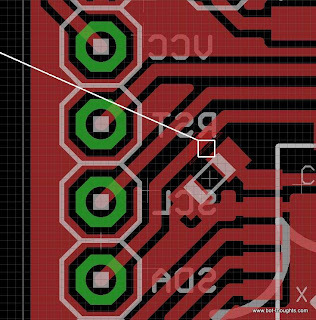 I've done PCBs with 0.5mm pitch QFP chips, 0603's, tiny 0.032" lettering (0.4" is better), SOICs, 12mil traces, etc. All the boards come back beautifully.